Tuesday October 5th and Wednesday October 6th, the third edition of the SOA & Cloud symposium took place in Berlin. The location was really nice: at Alexander Platz, close to the train station and with plenty of hotels in the vicinity of the conference center. I presented the case study Service Orientation in the Dutch Government.But I also attended many interesting sessions and talked to interesting people. The last session I attended the first day was Open Source Process Execution. Unfortunately, only two delegates were attending: someone from ASR and me. The talk was really on Activiti, an open source project that looks very promising. Coincidently, I ran into again someone who was using that in a meeting today. So the stuff I learned was already useful the same week! Ralph Schafermeier talked about corporate semantic web: Corporate Semantic Web – The Semantic Web Meets the Enterprise. He started with an introduction of semantic web, and announced that he would skip it if we looked bored. This introduction was good. The only bad thing was there were a couple of people in the room, they wanted every definition to be phrased ‘exactly right’. This took up valuable time. I guess this is to be expected from semantic web people, to discuss semantics . It distracted the attention from the real topic: application of this concept to BPM and CEP. Ralph showed a really interesting concept of adding semantic web annotations in BPMN models. This sounds to me as a very powerful concept that we will hear much more about in the future. If you want to check it out right now visit the Oryx site here. I did not look bored during this session, on the contrary! The last session I attended was Modern SOA Infrastructure and Open Source by Mark Little. This was not a very compelling story; personally I believe there are plenty of use cases where Open Source infrastructure is more than a viable option. However, the reasoning that was used in this presentation was full of circular logic: the definition of open is that the code is open source. Therefore Oracle can’t claim they are ‘open’. Or: “open source is built by real world developers”, as if closed sourced developers are not in the real world?!? This was I think a missed opportunity: it was based on prejudice and I doubt he convinced anybody who was not already convinced of the value of open source infrastructure. 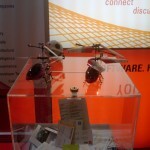 All in all a great two days, and I even went home with a helicopter from the Oracle stand!